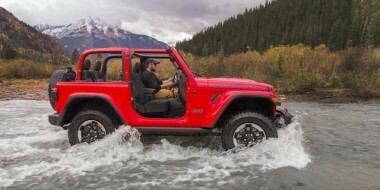 Jeep is celebrating its all-American heritage with seven concepts it will unveil at the annual Easter Safari, a week-long off-road extravaganza in Moab, Utah. 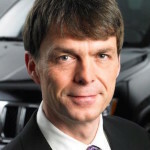 “We go to this event each year to showcase our latest Jeep production vehicles, as well as a variety of new ideas in our concept vehicles,” said Jeep president and CEO Mike Manley. 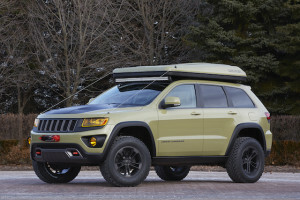 The concepts feature a host of Mopar and Jeep Performance Parts (JPP) for owners who want to transform their standard models into hard-out off-roaders. Mopar is a contraction of ‘motor’ and ‘parts’ and is original equipment for Chrysler and Jeep vehicles. Staff Car – Built as a salute to legendary Jeep military service vehicles, the open-air Wrangler Ltd-based model (top) highlights rugged functionality with heritage design cues. 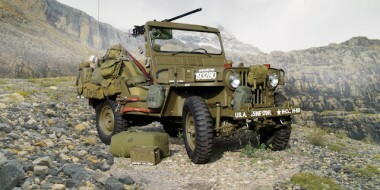 Its basic steel wheels, stretched canvas roof, bench seats, round headlights, rear-mounted spare tyre and vintage petrol can all echo the original military Jeeps. The Staff Car sits on 16-inch wheels with 35-inch Firestone NDT military tyres. It gets Fox shocks and Dana 44 axles.Under the bonnet is the 3.6-litre Pentastar V6 mated to a six-speed manual. 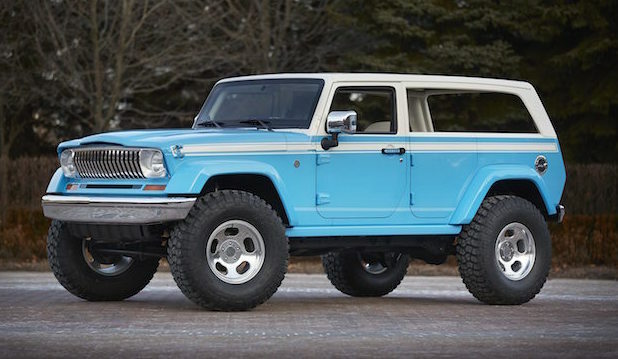 Jeep Chief – A tribute to the classic 1970s era full-size Jeep Cherokee, this Wrangler-based concept (above) evokes the surfer lifestyle. 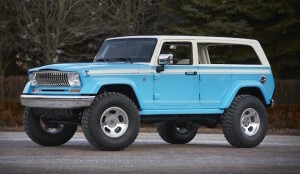 Exterior design cues include a vintage Ocean Blue exterior color scheme with a white roof; a modified razor grille that the original Wagoneer made famous; halogen headlamps; removable sides; chrome front and rear bumpers and classic, 17-inch slotted mag wheels. The Chief sports a selection of JPP add-ons including a 5cm lift kit with Fox shocks and front and rear Dana 44 axles with lockers, cold air intake and modified Rubicon rock rails. 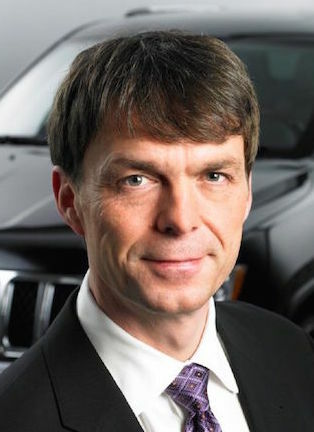 The Chief is powered by the Pentastar V6 mated to a six-speed manual transmission. 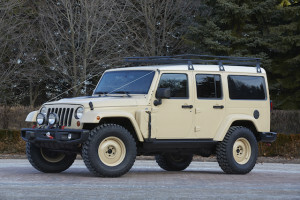 Wrangler Africa – The ultimate Jeep(above) for back-country and overland expeditions, with room for extra gear and auxiliary fuel tanks. It sports a high-clearance steel front bumper with winch, power step rock rails, power dome vented bonnet and an extended rear body and high-top roof. 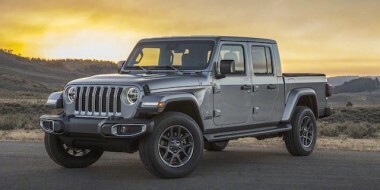 Powered by a 2.8-litre diesel engine mated to an automatic transmission, the Wrangler Africa also features fender-mounted auxiliary fuel cans. 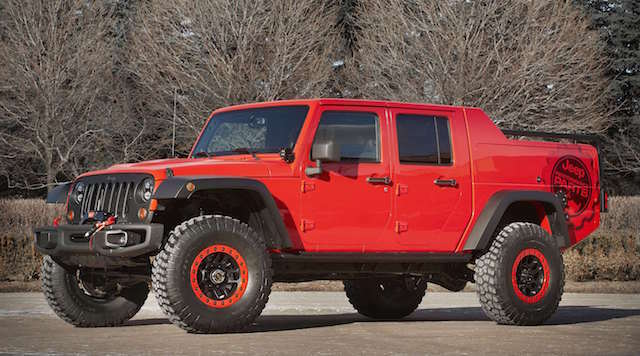 The Africa sports 17-inch body colour steel wheels with 35-inch BF Goodrich Mud Terrain tires. It uses Fox shocks, sway bar links and Dana 44 axles. Grand Cherokee Overlander – The Grand Cherokee-based Overlander (above) represents the rough-and-tumble side of Grand Cherokee. Features include a one-off front fascia, integrated front winch, tow hooks, larger wheel flares, SRT tail-lamps and bonnet, off-road rock rails, front and rear skid plates and 18-inch milled wheels with BF Goodrich All-terrain T/A tyres. The powertrain is the 3.0-litre diesel V6 engine mated to the eight-speed Torqueflight transmission. To top it off, the Overlander has a spray-in truck bed coating on the roof and a two-person hard-shell rooftop tent. Wrangler Red Rock Responder – Designed as a support vehicle (above) it carries premium off-road equipment and spare parts and tools stored in the cargo box. It stands out on any trail, with LED headlamps and foglamps, LED A-pillar and off-road lamps. Add-ons include 37-inch BF Goodrich Mud Terrain T/A KM2 tyres, 10cm of JPP lift, Fox shocks, and front and rear Dana 60 axles with 5.38 gearing from JPP. Cargo boxes on each side of the vehicle hold a hi-lift jack and accessories, fire extinguisher, road side accessory kit, first aid kit, Snap-on tool soft bags and recovery kit. It also stores an air hose and accessories, a dual compressor and air reservoir. It gets the Pentastar V6 and auto box.